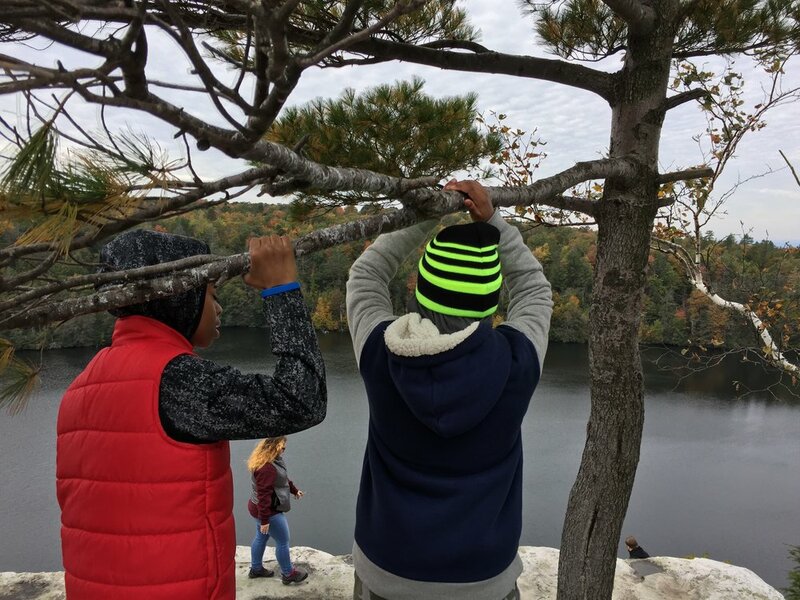 Minnewaska Hike — Matthew Potel Foundation, Inc.
Our most recent trip was to Minnewaska State Park and a nearby apple orchard and corn maze! On Oct. 21 Bear Cubs from Brooklyn and Yonkers headed out to the Hudson Valley for an adventure around the Lake with 10 official Bear Cubs mentors and friends. The kids got the opportunity to learn how to properly treat and filter water while hiking, build and jump inside tents, and prepare for a bear encounter (don’t worry, the biggest wild animal we saw was a fuzzy caterpillar!). After the hike we settled in for some delicious sandwiches and pumpkin pie, then went off to the apple orchard for some picking and a quick jaunt into the corn maze. The kids borrow a few mentors to crack the case on putting up a tent! Checking out the sweet scenery! Check out the wooly caterpillar that Julien found!